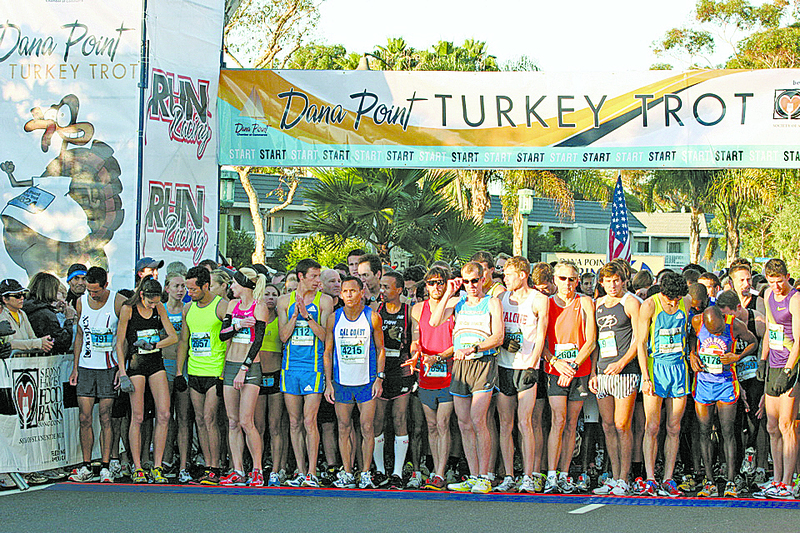 DANA POINT – With more than 17,000 participants, the Dana Point Turkey Trot is the sixth-largest turkey trot in the nation. Designed to offer both fun and fast-paced competition, boaters can join in the fun at this year’s event scheduled for Nov. 27. Participants can run, walk or dress up in costume for the 37th annual event held at Dana Point Harbor. Although many of the runners will go around the course in wacky costumes to compete for top honors, there will also be hard-core sport enthusiasts vying for speed awards in several divisions. Produced by the Dana Point Chamber of Commerce in conjunction with Run Racing, the Dana Point Turkey Trot features 5K and 10K runs, a “Kids’ Gobble Wobble,” and a two-day health and fitness expo. In the 10K men’s and women’s categories, the first-place awards are $1,000, second-place awards are $500 and third-place awards are $250. Age division medals will be awarded for the top three men and women in each division in the 5K and 10K events. Registration starts at 6 a.m. The 10K run is scheduled to start at 7 a.m., the 5K Masters start (40 and older) is at 8:30 a.m. and the 5K Open start is at 9:30 a.m.
Judging in the event’s costume contest judging will begin at 9:10 a.m. at the starting line. A 1-mile Kids’ Gobble Wobble Race, open to children 5 to 12 years of age, will start at 10:15 a.m. Runners can pick up race packets a day early — Nov. 26 — from noon to 7 p.m. in the parking lot at Dana Marina Plaza, at the northwest corner of Dana Point Harbor Drive and Golden Lantern. This year’s event will also include on-course entertainment and a post-race beer garden. For more information, call the Dana Point Chamber of Commerce at (949) 496-1555 or visit turkeytrot.com.